NRG raise funds packing bags! 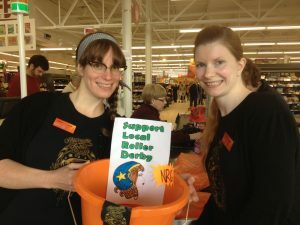 On Saturday 6th October 2012, Newcastle Roller Girls joined together to pack bags at Sainsburys in Monkseaton. A big thank you to Sainsburys who were extremely kind and accommodating, and to all the lovely shoppers who allowed us to carefully pack their bags giving generously to our cause. The grand total of 512 pounds will go towards finding us a new venue to bout in. Thank you to all involved! Previous PostNRG’s Canny Belters vs Middlesbrough Milk Rollers A TeamNext PostRainbow Frite writes a blog for Inside Line!